Morgan Shamy: What are YOU destined to WRITE? I had an interesting discussion this week with my hubby. I told him I was *thinking* about writing a memoir. I mean, I've definitely got the life experience for it. Not to get too deep or go off on a sob story (because really, we all have them) but we've dealt with some pretty extraordinary things. Dying child brought back to life, toddler surviving cancer, living with a world class athlete... to name a few. I swear sometimes my life feels like a soap opera... only I'm short losing my memory and finding out I've had a long lost twin my whole life. So yeah, why not write a memoir? I don't think I'd enjoy it. I love fantasy. Being transported to a world that takes you away from the real world. I like to escape the mundane things of every day life and feel what another character feels. To me, that’s what reading is all about. No offense to books like The Kite Runner, which I’ve read and did find amazzzzzing, but I really don’t *enjoy* reading books that make me… well, feel. It's difficult to know how horrible the world is outside of my little bubble. Because let’s face it, sometimes it’s hard enough to just survive inside the bubble. How did you choose your genre? Do you write what you like to read?? Did you have to sit down and think about it? Or did you always know? And have you started writing one thing only to do a complete turn around and write another? Labels: memoir, What are you destined to write? Your picture brings back memories. 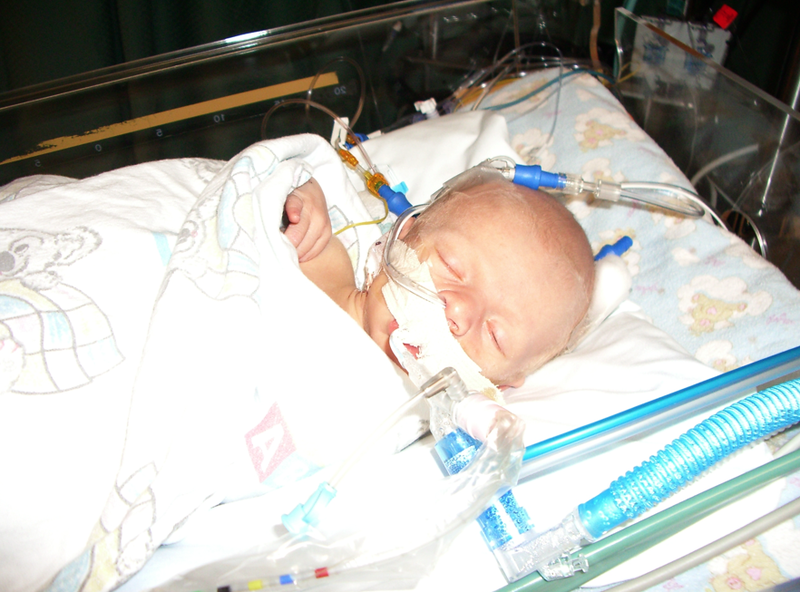 My oldest son spent weeks in the NICU for a collapsed lung. It was one of the hardest times of my life. As for what I like to write, I prefer fluff with a bit of steam and sweetness. Ha! I like to write creme puffs. Hehehe... yeah, I know I'm not that funny. My writing style developed over years, as I grew up and learned to embrace who I am and the things I love. I love humor, adventure, fantastic worlds, ordinary people who do extraordinary things, and the occasional heartfelt scene of romance and/or drama. I love dialogue above all, and characters interacting with each other is one of my favorite things to write. So, eventually, I just started writing all the things I love into my stories. I've never looked back! And from what I've read of The Year of Lightning, your story has ALL of those elements, Ryan! Wow that would make for quite a memoir… don’t suppose your husband is also a writer who could be persuaded to put it all on paper? "Love, Stories, and magic" <----exactly :D Like Shannon Hale. She nails this so well. And I don't really know why I picked myteries when I actually read just about everything. Hmmmmmmm??? A world class athlete? What kind? Well, the first MS I wrote was YA Dystopian. It was...my first one :) haha. Which means that though the story line is good, I've learned a ton and there's a reason why it didn't find a home. Then as I was querying the Contemp YA I started writing my YA Fantasy, and holy jebus! The whole thing came out in 10 days. 60,000 words in ten days. It just...worked. SO, for now anyway, I'm a YA Fantasy writer (or at least I will stick to the voice that my YA Fantasy has). It's getting some bites, so...we'll see! You bring up a very valid point. I think a lot of writers these days are trying to aim towards what is considered lucrative at any one moment, and it just doesn't work. You have to focus on what drives you and find your voice from there. I've done a lot of different genres - I'll listen to any idea that pops up and turns my crank. As I grow older, though, I've started focusing more on urban fantasy and horror...I like the freedom they give me to play with a lot of different archetypes and such. I think we've gotten so used to seeing fantasy tropes and horror cliches a certain way, and it's a really attractive proposition to take those same cliches and decimate them, to urge them to do different things. I also am always drawn to things that I feel can be a good metaphor for things I've been through or emotions I've felt and I find a lot of that in fairy tales. I'm not interested in ever doing a memoir, but when I work with this genre and mold it into urban fantasy, I find a way to filter my personal experiences into something much more interesting. Write a memoir!!!! Just because your life is so fascinating to me! You're seriously such an awesome person (and I am sorry about your kiddos--so hard!) I understand exactly what you're saying though. This new book is taking control of me! I've tried to quit writing it because I seriously freak myself out while doing research on haunted houses and stuff! I have this weird fascination for the macabre, but then I can't stand it if its toooo scary (and I'm such a wimp when it comes to actual horror movies), but at the same time I just love this story and know it needs to be told! Great post, as always. Oh, Morgan. I'd read your memoir. Yet, I feel I already know you so well, I wouldn't have to read it. Uh, that sounded creepy. I guess what I write is what comes to mind. I don't have to fall directly into one specific category. But I've always been pretty diverse. Even during high school, I tended to befriend all the cliques in school. Made me sort of a nomade with a few sturdy friends. I hung out with the goths, the preppies, the dorks (if you will). If I had an idea for a fantasy, I'd pretty much go for it. Anyway, I'd love to write a MG novel too. We'll see. I don't ever want to completely fall into one genre. I think that would limit me. Make sense? I'm actually doing a post on this in a couple of weeks. I'm going to link back to this because I think what you say is so right for some people. I am fielding my opinions right now. Writing the stories that are coming to me and not berating them for not being the genre I choose to write in the beginning. First off, I'm amazed by your strength and I think you are majorly blessed to have those challenges in your life because you are strong enough to handle them. I love you girl! I write what I like to read: fantasy. And I love to get really serious myself; I think the best stories are the ones that make the reader laugh and cry by turns. I write what my characters tell me to write. At this stage it's a Fantasy epic. I was reading through a Wikipedia article on Dean R. Koontz yesterday. I found it fascinating the themes that he visits again and again, the types of characters, blah blah blah. Anyway, the point is, I would bet that much of your life seeps into your novels no matter what genre you write. Don't you think it would be fun to see a similar Wikipedia page on you one day? This great analysis of your body of work and what it says about you and your life experiences? I get what you are saying. I like to read books that have a lot of levity. I prefer to laugh. I prefer to think of love stories and kissing and happily ever after. I wrote for the NaNoWrMo (got the min. # of words, but not something worth re-working). That's all I've written that is fiction. So, I can't truly answer how/what genre I am drawn to writing. --I think I've found I'm a pretty good personal essayist. I agree, I want to read stories that take me away from real life. I've read a few nonfiction books, but for the most part I avoid them. Living life is enough for me. When I first decided to write, I never gave much thought to what genre I was going to write in, I just began telling the story that was in my head. I've read a lot of fantasy in my life so fantasy is where I started. I love to read horror, romance and paranormal books as well. I have story ideas floating around in my head that incorporate all of them. The ones that bug me the most get my attention first. Even as I kid, I just enjoyed reading books that took me to some place new and different, that was in some way different from everyday stuff. I think writing just followed suit. It seems like we all read to take a vacation from real life. And if you DID write a memoir, it would be on my TBR list :) But just lie we read to get away, if you're like me, I also write to escape for a bit. And the cool thing is we can incorporate some of our life experiences int our fiction when the muse demands...you just never know what will happen when the fingers hit the keyboard. BTW You've been tagged! Check out my blog for 11 random questions to answer about yourself. I know exactly what you mean! Books like The Kite Runner (which I've also read, and yes it was amazing) make you feel so much that ISN'T happy. When I read (and write) it's because I want to escape the harsh realities of the real world (I don't mind the harsh realities of a fantasy/dystopian world!). I really respect people who write about that kind of stuff, but I'm not sure I could. I've contemplated writing a fiction piece based on a really difficult experience I went through, but I'm not sure it would be emotionally healthy to dredge up all those forgotten emotions, you know? So maybe not! PS - Wow, you've been through a lot! Sometimes I feel like people who write memoir are really just writing it for themselves. For therapy, for validation, for healing. It's not necessarily a bad thing, but even though it *feels* inspirational to readers, I think the author is the one who benefits most. I had a friend once whose favorite book was "A Child Called It." She read it over and over, mostly because she felt like she could relate to it, so maybe my theory is all whacked and there are readers who NEED those gritty, heartbreaking memoirs. Me? I read it, and it just made me depressed about how depraved some people are. Same thing with Kite Runner. I really didn't feel any better about the world. Also, we're in the same campaign group! Your life story definitely sounds memoir worthy, but it's understandable that you feel that way. I might read the occasional memoir or a book that I know will make me tear up (like the Fault in Our Stars), but my main goal is to escape problems that can affect my life. I don't mind books that take me to dark places like the prison-scape of Incarceron or the arena in the Hunger Games, but with stories like those, I know they're fantasy and that in the end, everything is going to be okay which makes all the difference. Oh that picture brings back memorys for me as well. I hope all is well, now? Anyway thank you for stopping by to say hello and to answer your question I always wanted to write fiction until 2 life changing events happened. My brother was murdered and my stepson died of suicide. The voices would not leave me alone until I told the stories:) I am working on a picture book now and having a blast. Hi Morgan, I'm stopping by from the Campaign from both the YA and Fantasy groups.